Dentistry is such a personally fulfilling profession. Working with my patients and teaching someone how to improve their health is a rewarding experience. The daily opportunity I have to help my patients maintain healthy smiles while also developing long lasting relationships with them and their families are the things I cherish most about my work. I feel truly blessed to have been providing the very best dental care to my patients for the past 26 years. I’ve been given the chance to improve their oral health and smiles, transforming their lives and self-esteem in the process. Having taken over the practice started by my father, Dr. Donald Lederman, in 1961, I still see patients that started with him 50 years ago. We have four generations of some families in our dental practice! I think that alone says a lot about the relationships that we have established. I am honored to be entrusted with their care. My continuing education has kept me current with the most innovative restorative treatments, materials, and treatment planning. I have focused much of my continuing education on newer technologies now offered in dentistry, like Invisalign® and CEREC® single-visit restorations. I have taken extensive restorative dentistry seminars with Frank Spear at the Scottsdale Center, focusing on advanced treatment planning, interdisciplinary treatment, and more. Also, as an affiliate instructor at the University of Washington School of Dentistry, Department of Oral Medicine, I am able to use my experience as a dentist to teach new generations of dentists how to be truly exceptional. Born in Oceanside, CA at Camp Pendleton, I was raised in Bellevue and have lived in Sammamish for the past 25 years. When I’m not in the office, I like to keep busy with gardening, skiing, cooking, and traveling. 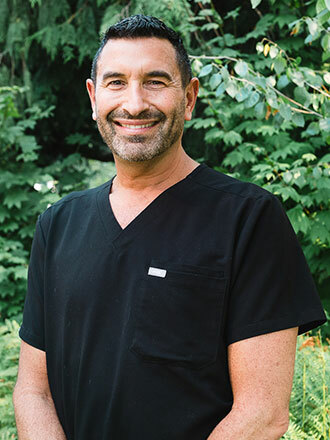 If you have any questions or would like to schedule an appointment with Dr. Lederman, please contact our Bellevue dental practice today. Our office is conveniently accessible to patients from the surrounding areas of Redmond, Issaquah, and Sammamish. We look forward to welcoming you into our practice family!